Happy New Year!! Chances are that no one is probably reading this because y’all are either sleeping in late after partying all night or nursing a hangover, or you could very well be reading this because you are like us and fall asleep before 10pm! It’s quite sad really. My husband and I haven’t been out on New Year’s Eve for years! And we’re not even the least bit concerned, but it bothers me a little bit because I’m really not that old! So, here’s hoping all of you that went out, had a great time and brought in 2014 in style and with some great food! Now that it is a New Year, how many made some resolutions? I used to many moons ago, but the fact I couldn’t stick to them led to so much disappointment that I stopped making them. I don’t make a list or anything, just in my head I decide to work on a couple of things. Like this year, one of my must dos is getting more organised where this blog is concerned! As far as the whole eating better and exercising resolution, yeah right, like we’re ever going to get that one going! I already eat organic, non GMO, now gluten free, but maybe I could eat less of it! How about you guys? Do you make resolutions? Do you stick to them? Or do you take baby steps like me? So, knowing that we’re not making resolutions to give up all our food, here’s a great cake to ring in the New Year. Most holidays are celebrated with something sweet, so I wanted my first post to be something delicious and sweet (not a cleansing smoothie). I have made this a few times and it is one from BBC Good Food magazine. I haven’t changed anything except to give you cup measurements, use different apples and I added vanilla. The first time I made it, everyone loved it and I just thought it was everyone being nice. The next few times I made it, everyone loved it then too. Since I am gluten free, I’ve only had nibbles. It is good, and I think it is because of how it’s made. This Apple and Blackberry Cake has a different texture. It’s a dense, almost pancake like cake. 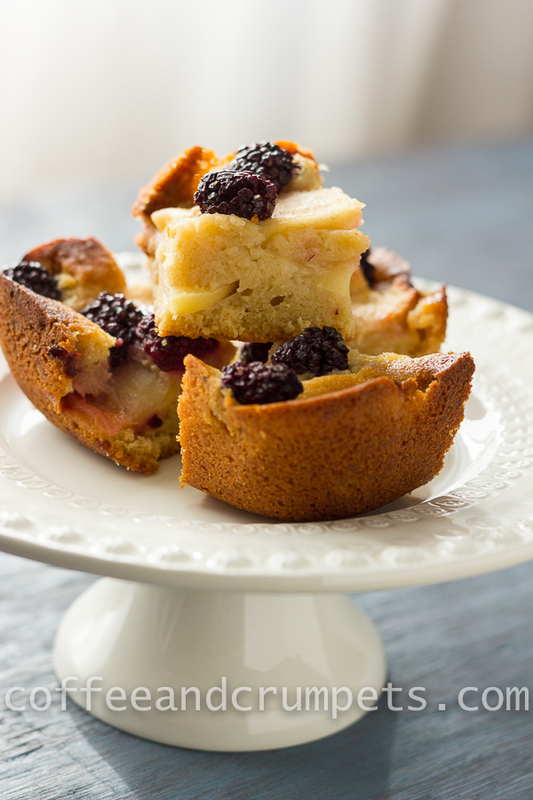 Delicious, lightly sweetened cake made with fresh apples and fresh blackberries. 1¼ cups/225g golden brown sugar/brown caster sugar, plus an extra tablespoon. Grease a 9" x 13"(23 cm x 33 cm) cake/roasting pan, with butter and flour or use spray and set aside. Peel, core and slice the apples into rings and then toss with a squeeze of lemon juice to keep from browning. Heat the cream and butter together in a pan till just boiling or can heat in the microwave and set aside, add the salt. Using a mixer, beat the eggs and sugar until pale and thick. Whisk the butter-cream mixture into the egg-sugar mixture. Fold in the flour and mix until completely smooth. Pour the batter into the prepared pan and arrange the apple slices over the top. Scatter over the blackberries and then sprinkle the extra tablespoon of sugar over the top. Bake 50-60 minutes until golden and the sides are beginning to pull away from the sides. The original recipe asked to use a smaller pan, an 8" x 12"(20 cm x 30 cm). It works in either pan. I wanted to thank everyone who reads, comments, shares and follows my blog. I have loved reading your comments and been humbled by your kind words of encouragement and support this past year. I look forward to strengthening my old friendships and discovering new ones. Thank you for a great year. Here’s to 2014, cheers! Hi Nazneen! Give up (good) food for the new year? Never! I love cakes and cookies… I wanted to make some this weekend but the words out of my wife’s mouth were less than encouraging: “I don’t think anyone around here needs more cake at the moment” – oh dear :(. I love the look of the cake – how were the blackberries? They look positively luscious on top! The only ones I can get here at the moment are horrid ones from the store which are all sour. I used to love going picking blackberries in England and France. Fresh and ripe from the hedgerows they were so sweet. You just can’t match that with store-bought ones I’ve always found, even if ones you pick yourself are usually much smaller. Charles recently posted..Falafel – Crispy, Fluffy… Delicious! Looks crisp and perfect. I could do with a big slice on this freezing morning of -10 degrees….brrrrr……more than the cake, my eyes get drawn to the cuppa you have with it…..sip sip! Thanks Minnie! I hope you guys are keeping warm! We had our Arctic blast a few weeks ago, it was so cold it was insane, so I know how you are feeling. It’s snowing here today as well but we’re hovering below freezing, nothing like you guys!! I am the same way – cant stick to resolutions for very long. I think it overwhelms me more than anything..I had a quiet NYE too..I hope to stay healthy and happy thats all for the goals. I would have gladly swapped my night of partying for a night in…especially if this cake was involved! I’m still feeling the effects of NYE. Getting too old for this! This cake looks great, and it is perfect with a cup of coffee…yum! I love the fruits in it. Thank you so much Juliana! Hope your New Year is off to a good start. Every year I make a NY resolution and every year its pretty much broken by the Feb! Oh dear. I just don’t trust myself anymore lol. Thanks Lisa! That’s why I don’t bother 🙂 Why get miserable over something you couldn’t do ;)? Holy Cow! Yummers, Im licking my lips! Thank you very much, Dina! I not at all into this resolution thing. If I want to accomplish something, I just do it. I like the denseness of this cake just like bread pudding and the combination sound good. Have a very good 2014! Thank you Balvinder! I know, i just do what I have to, all this resolution stuff is so silly. Oh well. I am last person to make a resolution…that too giving up on sweets…NO WAY! I just love the combination of apples and blackberry and I have a cake on my blog with the same combination too. This one looks so lovely and moist…no one is allowed to miss a cake like that! I would have loved to post a dessert to start the year but I am still relying on last year’s recipes that I haven’t posted. I am yet to unpack all the stuff I have put in boxes. Hope you are enjoying the New Year! Thank you, Anne! I just couldn’t post a detox or cleansing recipe of any sort, mainly because I don’t know of any!! Well, i drank to many of Mr. Kitchen Riff’s French 75’s so I had a very happy new year AND my Manservant did all the dishes! We always have a few friends over for a nice meal and then watch the ball drop on TV. I’m not sure though, that I saw the ball drop last night! In any case, it was nice to see another of your gorgeous photos tonight! And it’s not even blurry! happy new Year, Nazneen! Oh my gosh, Abbe, I am laughing too hard! I am so glad you had a good time, and so nice of the Manservant to clean up for you!! I love this sweet start to your year, Nazneen! We almost always stay in on NYE and I’m totally happy with that! And I stopped making “resolutions” many moons ago (I sound ancient!) but I do feel it’s a time to be more aware and to think about small things we can do to better ourselves. But nothing dramatic or any kind of proclamation like that. I do always vow to eat well so this apple blackberry cake is just the kind of thing I like to see first thing in 2014! Thanks Monica! I hope you had a great evening at home. I would’ve gone to bed at 9 if it wasn’t for everyone else texting me from other time zones wishing me HN! Looking forward to your posts in 2014! Thank you so much Charlie, wishing the same to all of you. I bet it is quite different atmosphere there for NYE. I think many of us just prefer to not deal with the drinking and driving. It gets quite messy! We never go out on New Year’s Eve although we do stay up until midnight. But we often stay up that late! Anyway, lovely recipe. Happy New Year! Thank you John! Happy New Year to you! I look forward to your wonderful posts in the coming year! Thanks for another tempting recipe. I love to cook with apples at this time of year, so will definitely try this one. Thank you Hilda! I hope you like it! Hi David! No, no, they aren’t from my garden, I wish! They’re from the store, they had a good deal on them at the shops here. Thank you for being such a great friend, David! I look forward to our friendship and your wonderful posts in 2014. Thank you for not posting a cleansing smoothie, this is much more refreshing. Beautiful cake Nazneen. Happy New Year. You’re the first blog post I’ve read in 2014, and I’m wishing you a blogtastic 2014. Did I just say that? 🙂 My New Year’s resolution is “less is more”. I’ve got to purge of excesses. I’ve got so much “stuff” in my house that I can’t find anything. And what’s left will be organized. And yes, that will take baby steps. In bed at 9:30 last night, I’m all fired up to cook something delicious on my mid-week day off. Thank you Lea Ann! I couldn’t stomach a cleansing smoothie anyway! I can’t make such resolutions because they never pan out! I like to make little changes throughout the year. But I do hope you get your projects accomplished. Happy New Year!!! Great first recipe of the year 2014!!! Looking forwards to more….Happy blogging in 2014 !!! Thanks Kat, Happy New Years to you too. Happy New Year, Nazneen. Wishing you a great year. No, I don’t wait till Jan 1st to make a resolution. Never did. Great cake. I baked a cake today with apples too. What a coincidence. Lail | With A Spin recently posted..Good Bye 2013, Hello 2014!! Thanks Lail! Happy New Years to you too. Wonderful apple blackberry cake! Wishing you a very happy new year. Well, I am here reading and enjoying your post on new years eve 🙂 we are the same who have not been out for new years eve since a very long time, but not to regret we enjoy calling home and wishing our family and friends….and of course making rich desserts and eating has become our tradition of celebrating new year. Thank you Deepti! I hope you had a wonderful New Years and continue to do so throughout the year! I look forward to your posts.